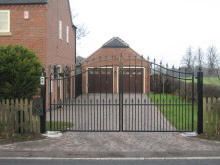 At The Gate Installation Company we can offer the complete automation package to your existing gates or to new timber or wrought iron gates manufactured in our workshop. All systems are suitable for both Iron and wooden gates and are designed to surpass current legislative requirements. Proximity card/fob entry systems for larger commercial premises. We would be pleased to provide a free no obligation quote, just contact us. All images copyright © The Gate Installation Company 2008. All rights reserved. The Gate Installation Company, Unit 23, Stoke Mill Industrial Estate, Mill Road, Sharnbrook, Bedfordshire MK44 1NN - Electric Gates, Wrought Iron Gates, Metal Gates, Wooden Gates UK. 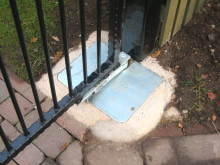 CAME Blu-partners, wood gates, field gates, metal gates, railings. Gate Automation UK, Automatic Gates Installation Bedfordshire, Timber Gate Fitters and Wrought iron Gate Manufacturers, Gate Restoration, garage doors, electric gates, automatic gates, entrance systems, Wrought iron gate fabrication UK, Buckinghamshire, Hertfordshire, Beds, Northamptonshire, Cambridgeshire.